If you weren't able to make it to our recent Symposium 'From Islands to Networks', or you would like to revisit the speakers' talks, we are making them available - slowly but surely - on our website. You can now access pdfs of Dr Veronica Doerr, Prof Andrew Bennett and Prof Ary Hoffman and Rebecca Jordan's presentations on a Symposium webpage. Audio recordings of their talks will follow, as will summaries of all talks. We heard at the Symposium how important all scales of connectivity in the landscape are, but our speakers especially well demonstrated the vital need for connectivity at scales of 200 – 300 km; to allow for natural species movements and migrations, as well as giving species a chance to adjust to our rapidly changing climate. CVBA has been developing to help ensure that we achieve those vital connections at the scales needed. It was interesting just how many of the speakers stressed that this can only be done by working together and talking with your neighbours. 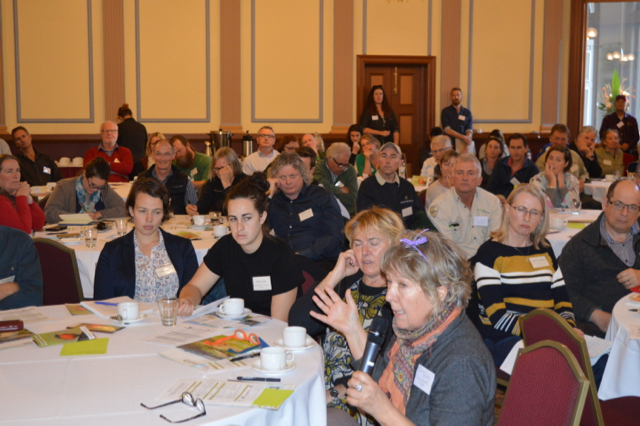 The fantastic show of really engaged people at the Symposium was a step towards making it happen (click here for feedback from the Symposium). We are currently working on enhancing our website to better share the science and practical know-how for smart, effective and strategic conservation in central Victoria - watch this space!